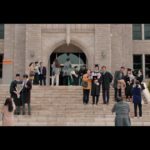 In a flashback in episode 2 of Encounter/Boyfriend (남자친구) (tvN, 2018-19) as Kim Jin-hyeok (Park Bo-gum) answered questions at his interview with Donghwa Hotel, this is seen as the university that he graduated from. He and his parents are all smiles as they pose in front of the school. Dongguk University [동국대학교] is a private university that was established in 1906 as a Buddhist-run school, and continues to be affiliated with Buddhism today. Myeongjin Hall [명진관], where the Encounter scene was filmed, is the oldest building in the university, built in 1959. The university is located in Seoul’s neighborhood of Jangchungdong-2(ee)ga [장충동2가] in the Jung District [Jung-gu/중구].